To get a FREE Magazine Subscription to Outdoor Life, all you have to do is fill out a simple form! 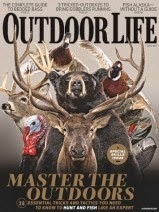 Outdoor Life magazine is the ultimate resource for all hunting and fishing enthusiasts. Its topics and themes cover everything you will need to know about different kinds of gear, places to go and not go, and the best conditions to capture the perfect game. From disaster areas to new accessories and tools on the market, each volume of Outdoor Life magazine strives to bring you the hottest information out there. In each issue of this magazine you will find one section devoted to hunting. You will discover new details on how to track down the certain type of game you are looking for, whether that be white tailed deer or elk, and the best way to bag the animal. There is also a section devoted to fishing, with information for both saltwater and freshwater fishermen. Of course, there is a section devoted to guns and one devoted to gear - both things are essentials for those who want to dive into outdoor living themselves.